We sure love to hear about new products from our customers. In this case, we owe thanks to our good friend, Laurel Grose who introduced us to the super cute Violet Field Threads patterns. This new-to-us line of kids clothing patterns has been a delight to have in the store and I recently had the pleasure of making up a couple of samples with two of them. The Josephine Top comes together beautifully. Sweet little details like the pintucks and ruffle tab down the front make this pattern fun and interesting to sew. I also love the ruffle sleeve and the collar. The pattern includes a long-sleeved variation and a dress length. Although the photos are sometimes a bit hard to decipher, I found the instructions to be clear and acurate. Probably best for advanced beginner or intermediate sewers. The fabric I used—a cotton lawn from Alexander Henry—was a dream to work with. It is buttery soft, yet irons up very crisp. We still have a few yards in the store if you want to get your hands on some! The Whitney pants may be a new favorite of mine. Stylish and unique, they would be great for special occasions, yet equally practical for the playground as a culotte version (next on my to-make list). Although they appear a bit complicated they are quite straightforward in their construction and come together quickly and easily. Gina suggested using this cotton/tencel blend denim which turned out to be the perfect choice. The pants are jean-like, yet soft and drapey. They really look so good, you have to see them in person. What a sweet outfit this makes! A quick word about sizing for both patterns. I made a size 6 with no modifications and the model in the photos is an average-sized 7-year-old. 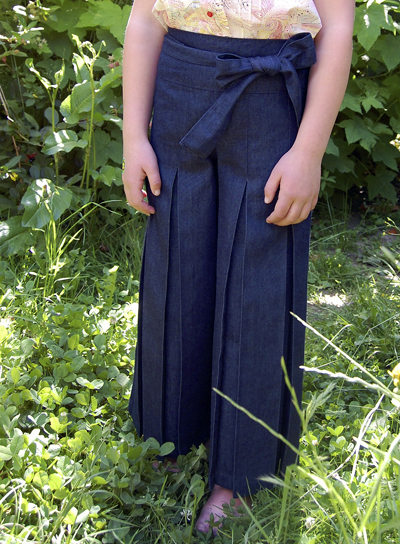 My daughter is 8 and can wear them but the pants are too short—thus my culotte idea was born. Just a reminder of how important it is to measure your child!